It rained and it rained and it rained, the cobbles and shiny pavements of the old town of Trento getting slippier and slippier and the temperature dropping from about 30C at the start to barely 20 at the finish. 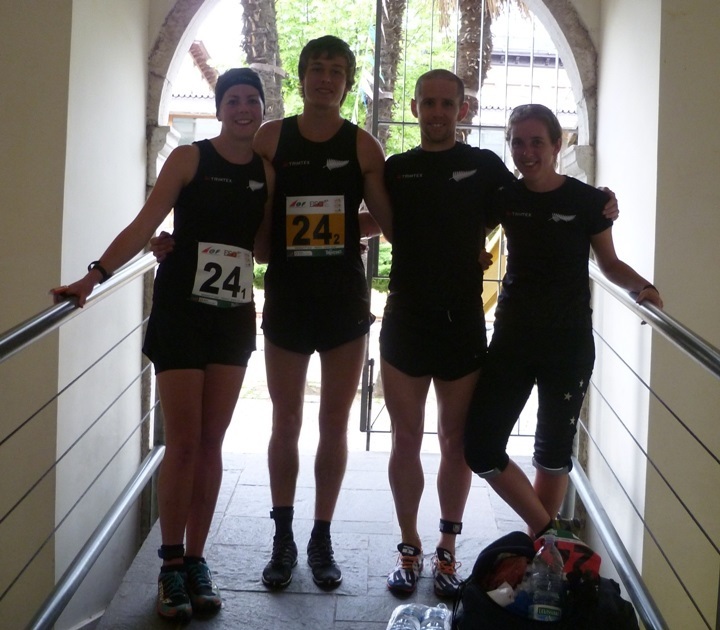 And along the with the rain, New Zealand’s initially bright hopes in the first ever sprint relay at WOC, gradually disappeared down the drains of Trento. Things started brightly with quarantine in the courtyard of the local convent and the nuns looking on somewhat bewilderedly as the world’s best orienteers set about their preparations. At 5.30 pm local time the first WOC sprint relay was set off with a loud gunshot.. With the first leg runners lined up in four rows in alphabetical order, Greta was on line 3 and in danger of being trampled by Russia, Sweden, Switzerland and Ukraine all on the row behind. However, this ignominious fate avoided, Greta got us off to a good start coming in in 11th place, less than 30s down on the leaders Russia, to hand over to Tim. With many of the fastest men from the individual sprint final on the second leg, Tim was always going to be up against it and as he handed over to Ross for the 3rd leg New Zealand was down to 17th and now nearly 2 minutes down on surprise leaders Belgium for whom Yannick Michiels had stormed around. As the rain poured down and thunder rolled around the hills Ross ran a good 3rd leg, with the 13th fastest time on it, pulling us up two places to 15th as he handed over to Lizzie on the anchor leg. At the front of the field normal service had been restored with the Swiss moving ahead of Russia and with Sweden in 3rd place. Lizzie ran her usual steady race, and, finding cornering increasingly difficult and almost being taken out by a bus at one point, finally pulled us up to a creditable 14th place. Meanwhile, despite a desperate attempt by Maja Alm of Denmark to overhaul her, Judith Wyder, the women’s individual winner brought Switzerland home for the gold, with Russia dropping to 3rd. Retrospectively, looking at the maps, with the exception of one long leg across the map, there was in fact very little route choice, and, as in the individual finals, the courses were very much made for the runners rather than the technical sprinters. Personally, although they were admirably set up for spectators, I felt the courses were rather weak. If this is a sign of things to come at WOC in the sprint relay it may well be that New Zealand is going to have to change its approach to sprint orienteering. Anyway, now we move to the long distance on Wednesday. After much discussion Matt will now be our men’s representative, with Greta running in the women’s race. The long, the middle and Saturday’s relays are crucial to New Zealand attempting to move up from Group 3 to Group 2 and thereby gain more than 1 runner in each of the long and the middle distances. Points are awarded to nations on the basis of finishing positions and the total points from 2013 and 2014 combined will be used to determine who is promoted from Group 3 to Group 2. From the point of view of developing opportunities for New Zealand orienteers to compete at the highest level, a lot hangs on the next few days. Great reports from WOC, Malcolm! And good news that NZ will have a runner in the Men’s Long. Good luck to all the team for the remaining events.